Job was a devoted, honest man who God blessed abundantly. But suddenly all his blessings were taken away: his family, his fortune and his health. Before this, Job’s faith in God had never been tested. Job only knew and trusted God based on what others told him, not on his own personal knowledge of God. Because Job did not know God personally, when trials came, Job blamed and doubted God. Only after God revealed himself to Job and Job experienced God personally, did Job comprehend who God was and humble himself before the Lord. Job said to God, “I know that you can do all things; no purpose of yours can be thwarted.” Job 42:2 Once Job had humbled Himself, God eventually restored all that Job had lost and made him twice as prosperous. For many years, I had heard of God, but I did not see God: I did not have personal knowledge of who He was. Growing up in church, I heard people say all these wonderful things about a God that I did not know or understand. I liked what I heard, if it was true, but I wasn’t convinced that it was. I had no personal experience with God and He seemed so remote. I knew of God, but I did not see God. So when an unthinkable tragedy struck my family, I cried out to the God I did not know for an explanation: “ God, if You are who I have heard them say that you are, why did you let this happen?” When I didn’t hear an answer, I became angry and began to doubt all that I had heard of God. When tragedy struck my family again and my life was forever changed, I was convinced that God was not fair or just, because if He was, He would have never let the unthinkable happen again. I did not see God. I had no personal knowledge of God to sustain me through these rough times. I stopped believing. Because of God’s relentless love, my story does not end there. God pursued me by sending people into my life time and time again to show me His love and eventually my heart began to soften. I began to believe that maybe, just maybe God was those things that others claimed Him to be. Eventually I began to see God for myself and did not need to rely on what others said about Him. I began to know Him personally through His two greatest gifts to us: His Word and His Son, Jesus Christ our LORD and Savior. Now I understand that God was not to blame for the tragedies in my life and that He was there all along. Now I understand that God speaks to me through His Word and that if I know His Word, I will know Him. My ears had heard of God but now my eyes have seen Him! Oh, Stephanie! I love this post. How I can so identify with much of what you said. When we went through a particularly rough year of our life, I kept getting called back to read Job. He was so faithful and so good during this time. I enjoy reading your blogs so much and you have such an amazing passion and love for God that oozes over into your group. Bless you sweet friend! Jennifer – thank you so much, I am so thankful for you! “if I know His Word, I will know Him” – such truth in those words! Stephanie, what an awesome testimony. That your story did not end in anger, but was given new eyes to see God – amazing! Thank you for reminding us that God is faithful! 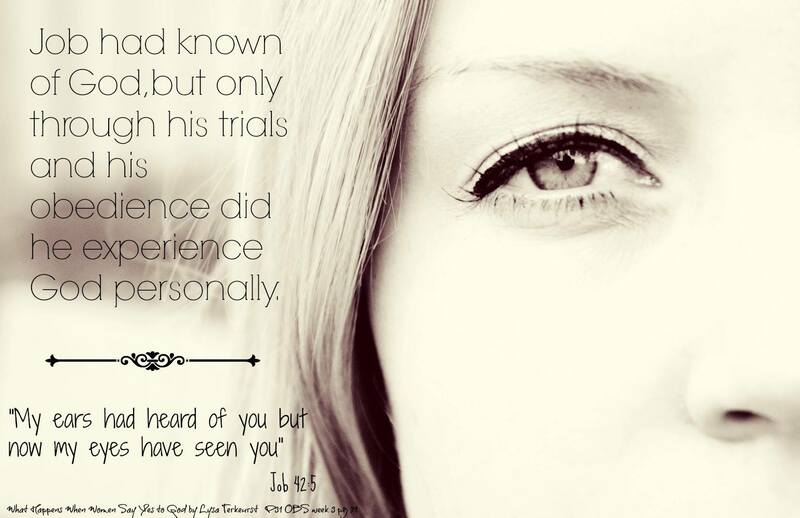 Wow, only through his trials and obedience did he experience God personally. It gives another perspective on trials and difficult times, it isn’t always what we want but trials seem to open our eyes and experience God even more then we imagined! Thanks for sharing. Stephanie, I have know many people who have view God through the lens of life tragedies. That the way the enemy would like things to stay. I am so grateful that God opened the eyes of your heart to see His heart of goodness and love. I’m glad He did the same for me. Jesus said that it is Satan who comes to steal, kill, and destroy. God sent His Son, the Lord Jesus to bring life in abundance. We see Him and we know Him. 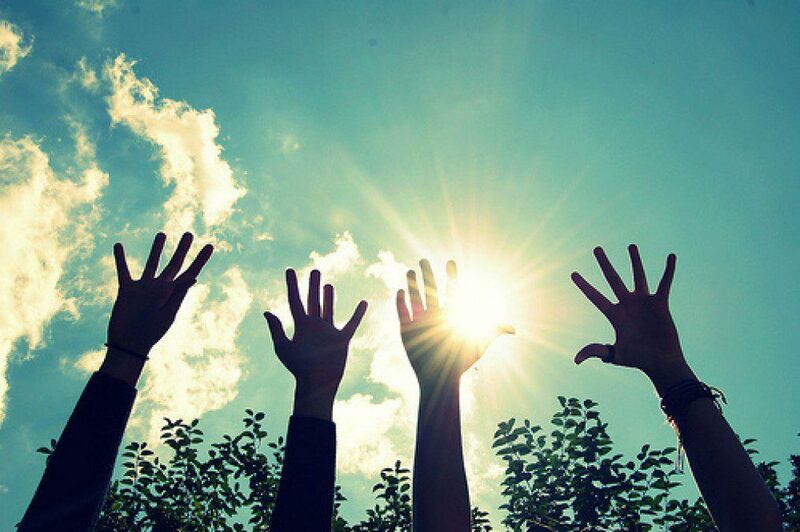 May that Light continue to shine in and through you more and more brightly. I just love this blog. Thank you Barbara! You are absolutely right, the enemy is the one who steals, kills and destroys! So thankful, I finally figured that out. Love this, Stephanie! So often I think of Job and think… what a downer =) I mean, so much happens to him and such bad luck, and really, who wants to read that… but he is a story of redemption and faith. Thank you for sharing this! Oh my gosh….. I stumbled upon your page by accident, well probably not by accident since there are no accidents in God’s world; but I was looking at graphics for the book of Job, which is where the Spirit led me to read today….